A couple of months ago while poking around Twitter (as I often do, come say hello), I saw something about a food blogger cookie swap from Lindsay over at Love and Olive Oil. But not just any old cookie swap…The 2nd Annual GREAT Food Blogger Cookie Swap hosted by her and Julie from The Little Kitchen. Being relatively new to the blogging world, I knew that we absolutely had to participate. I’m obsessed with cookies. Like seriously take-my-cookie-and-you’re-going-down obsessed. You guys can keep your cupcakes, cakes, and spoonfuls of Nutella. I’ll take a perfect plain chocolate chip cookie any day. In fact, I’ll probably steal yours when you’re not looking. All of the money goes to a great cause, Cookies for Kids Cancer, a national nonprofit that raises money for new cancer therapies for children through local (and now virtual!) bake sales. I’ve done a local cookie swap here in Boston that supported them last year and it was a blast. 6 new friends, 36 cookies, and a good cause? Count me in. I was a little intimidated to say the least. Especially of Jocelyn who I’ve seen around Twitter and is a master baker (turns out she’s hilarious and awesome!). I knew that I had to come up with something epic. A cookie that represented everything about how I love to cook. A bit classic, a bit new, rich, decadent, and just a little crazy. And so, the BSBBCCCPBC was born. For you non-codebreakers, that’s a Brown Sugar Brown Butter Chocolate Chip Cookie with Peanut Brittle Crunch. 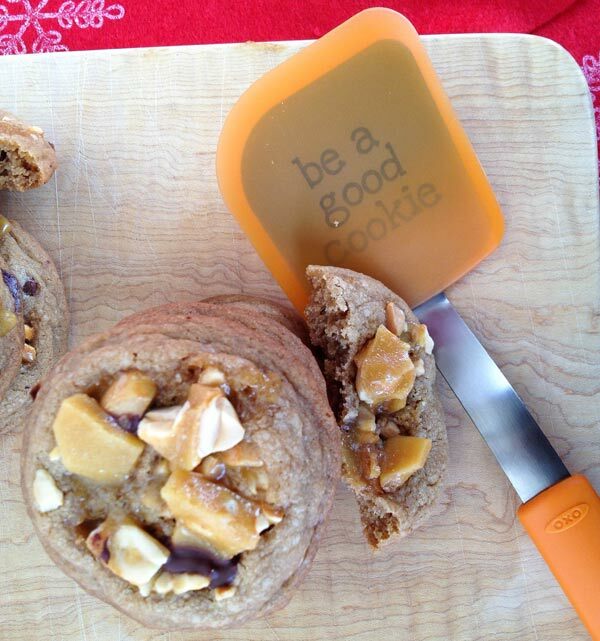 It’s a mouthful (and thanks to OXO for the awesome spatula!). It was inspired by a new favorite ice cream flavor I had a few weeks ago at a local Boston ice cream legend Toscanini’s: the B^3 – Brown Sugar, Brown Butter, and Brownie. Insanely good. The brown sugar and brown butter in the base gives the ice cream a rich, nutty, deep flavor and the little bits of super-chocolatey brownies are addictive. I originally tried to make a cookie with as many “B’s” as possible but after a few failed attempts, I had to resort to 5 B’s, 1 S, and 4 C’s. Not bad. I started with my go-to base chocolate chip recipe that has some brown butter in it, but for this one, I used all brown butter and all brown sugar. I wanted to add a textural contrast so I came up with the idea of adding little shards of peanut brittle for a nutty crunch right on top. And I had to leave the chocolate chips in. Yes, that’s right. HAD to. In the midst of all of this baking, a couple of exciting packages arrived on our doorstep. Our cookies from everyone else had arrived! In the middle: Old-fashioned, nutty Cream Filbert Cookies (with Hazelnuts!) from Rene at RetroGrannie Cooks. She also sent us a handmade chocolate chip cookie ornament. – thanks Rene, it’s on our tree! On the right: Monstrous, filled with everything Monster Cookies from the lovely Steph of Steph’s Bite by Bite. These things even had those mini M&Ms which we love! 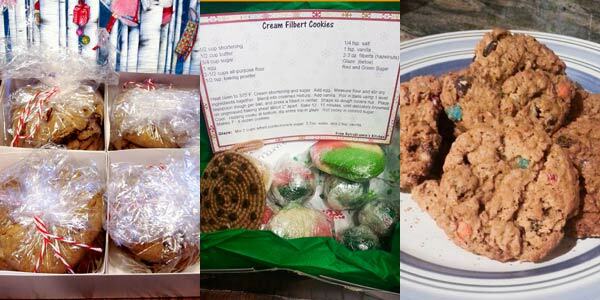 A huge thanks to Nicole, Rene, and Steph for the cookies, notes, and gifts – your cookies are already gone! And now on to the main event. Make sure to read the recipe carefully because the technique is a little wacky but trust me, it works! I used this recipe from Brown Eyed Baker almost exactly so head on over there to see the recipe! 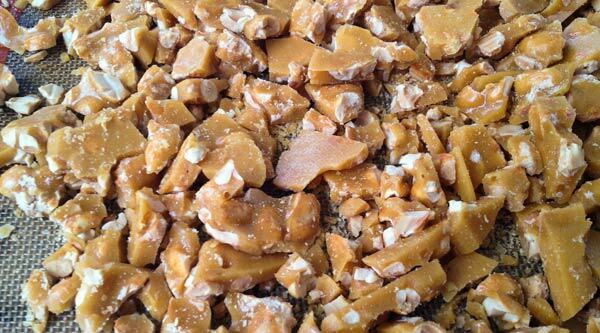 Make the brittle according to this recipe. After it cools and hardens, use the end of the handle of a wooden spoon to break it up into manageable pieces. Transfer the shards of brittle to a couple of large zip-top bags, squeezing the air out. Let out a little aggression with a rolling pin to smash the brittle into small pieces. Set aside. Pre-heat oven to 375 degrees. Line 2 baking sheets with parchment paper or a silpat. In a bowl, sift together all-purpose flour and baking soda. Melt the butter on medium heat until it is nutty and golden brown, 3-5 minutes. Make sure to watch this carefully and have a bowl nearby to pour into when the color is right. Pour into the bowl and set aside to cool for 10 minutes. In a stand mixer with a whisk attachment, add melted butter. Add dark brown sugar, light brown sugar, salt, and vanilla extract. Whisk on medium speed until well combined. Add egg and egg yolk. Whisk on medium speed until no lumps remain. Let sit for 3 minutes. Whisk on medium for 30 seconds. Rest for 3 minutes and whisk for 30 seconds 2 more times until mixture is thick and shiny. Remove bowl from mixer. With a rubber spatula, fold flour mixture into wet ingredients until well combined. Add chocolate chips and fold in until combined. Chill for 1-2 hours in the fridge. Roll a heaping tablespoon of batter into a ball and place on baking sheets, separated by 2 inches. Bake sheets 1 at a time for ~10 minutes until edges are puffy and centers are just barely cooked through, rotating halfway through. Remove from heat and quickly place little pieces of brittle into each cookie, pushing them in slightly. Remove from the oven and allow to cool on the pan for 5 minutes or until safe to transfer to a wire rack. Allow to cool completely. I firmly believe there is no better way to end a meal than with a cookie. And these cookies would be a perfect end to any meal! @da4e616454164f66d6799d001db3d517:disqus And by “meal” you don’t just mean dinner do you?? 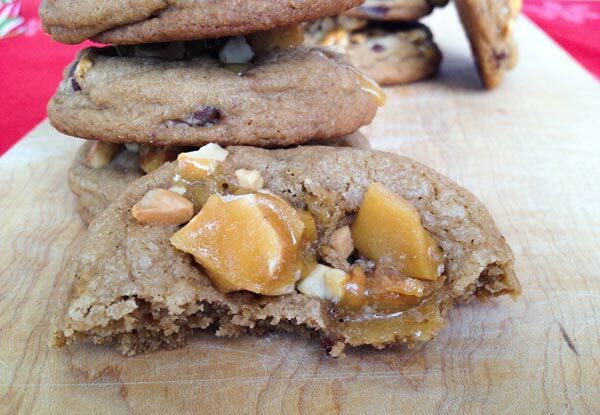 The base chocolate chip cookie is totally over the top as it is and the peanut brittle just took things to the next level. Thanks so much for stopping by! These cookies are a perfect end of summer cookie. I’m going to try these soon and hopefully mine will turn out at least half as good as yours looks! They’re the perfect anytime cookie @foodiemarie:disqus =). These are just as good without the peanut brittle on top but those really put it over the top! I feel compelled to comment, even though it’s been over two years since you posted this. THIS IS THE PERFECT CHOCOLATE CHIP COOKIE RECIPE. Sorry for the capslock, but I have been trying to make melted/browned butter cookies work for over a year. Each and every batch wound up with the chocolate chips or nuts “floating” to the top of a greasy cookie dough matrix. Your directions cleared everything up. I am guessing it was the fussy mix/rest with the wet ingredients that de-greasified the cookie dough. Thanks again for your detailed instructions! Thanks so much for your kind comments and glad that you loved the cookies! Your tip is a great one. Because of the high % of butter, the dough does become very hard after chilling. However, leaving it out for about 15 minutes before trying to scoop helps a lot.